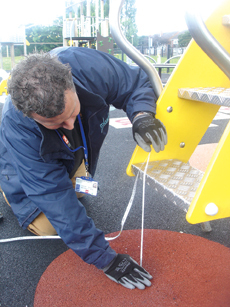 Maintenance Services - Proludic UK - High Quality Play Equipment! Proludic have a dedicated contracts and maintenance team who are committed to help you to look after your play equipment. All of our playground equipment meets all the requirements of BS EN 1176. The materials we use and equipment we manufacture are subjected to vigorous mechanical tests giving assurance of the quality and strength of our equipment. Our ISO 9001 highlights our dedication to continuous improvement through our robust quality management system. Maintenance and upkeep of your play area is vital to ensure success and sustainability. As an experienced company in this field we are able to carry out the fitting of spare parts and organise bespoke maintenance packages to suit your needs. All parts used will be Proludic specification parts ensuring that guarantees are maintained. All parts will be fitted by our inspectors and engineers who are accredited to the Register of Play Inspectors International (RPII). Should you require any spares or accessories for our play equipment, we do carry an extensive stock within the UK and aim to send them out as soon as possible. Proludic’s Key Performance Indicators (KPI’s) is to handle and close any issues within 10 working days, we are currently meeting 92% of all cases reported. 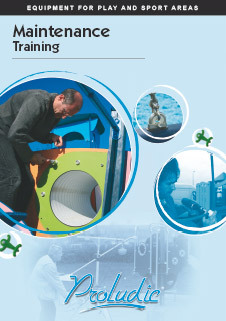 For detailed information on maintaining your Proludic play equipment for optimum durability, please feel free to download the maintenance training. Whatever your requirement, call our Customer Services Team on 0115 982 3980 or click here to email them for any technical support.